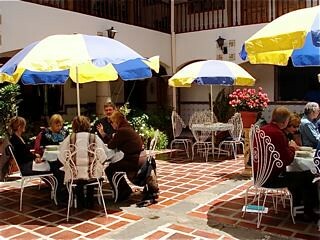 Ecuador internet businesses just became easier so you just became more free. If more freedom in your lifestyle is a goal, the good news is that technology makes it easier for your lifestyle to give you freedom in Ecuador…with your own global internet business. 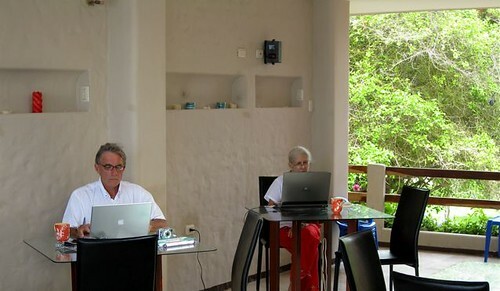 You can gain freedom of lifestyle…in an office no bigger than your laptop! As a tiny business you can compete with and beat big business? Merri and I are proof that you can enjoy such success, freedom and a lifestyle that most people just envy rather than do anything about. Merri and I have, what I like to call, the tiniest, most profitable internet publishing business in the world. This business provides a great living. More important it gives us freedom to live wherever we choose…and our choices may seem odd. We live part time on our Blue Ridge Merrily Farms..far far from civilization…2.5 hours to the nearest city. 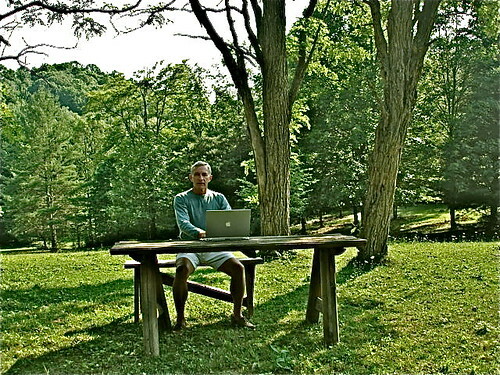 Here I am working there in my favorite summer office deep in the woods. 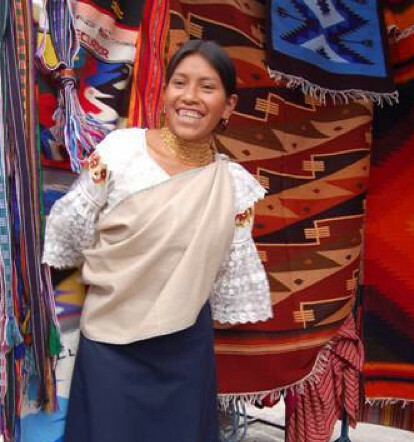 Part of the rest of the time…when we are not traveling…we live in a remote Andean Village at our Cotacachi Hotel, El Meson de las Flores. 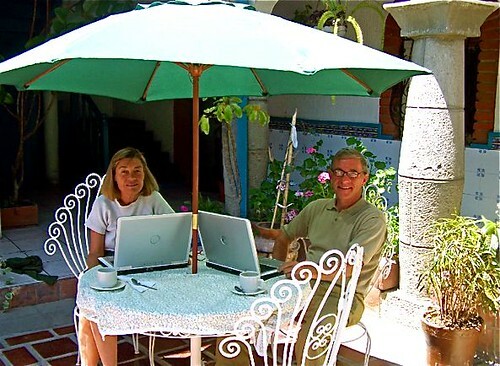 Here Merri and I work during the winter in our sunny Cotacachi open air court yard. 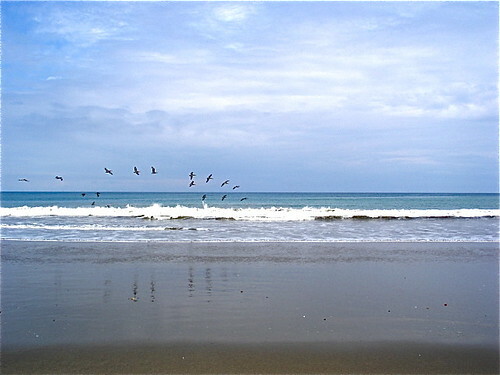 Plus we spend time at our Ecuador beach apartment as well. 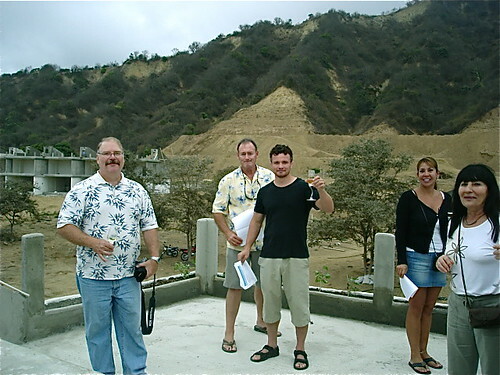 Here I am at the Pamazul,the clubhouse for our Vistazul condos…working? We can run our internet business from any one of these places…now more easily than before. Ecuador internet services continue to develop at a rapid pace and the latest development is mobile internet in Ecuador. Three cell phone operators now offer an internet connection via a USB modem that receives data from cell phone networks. In other words wherever in Ecuador cell phones work there is access to broadband. If you have the little modem and a lap top computer you can hook up to the internet anywhere in Ecuador where you receive a cell phone signal from an Ecuadorian cell phone supplier. This gives you the freedom to go anywhere that has even a hint of civilization. You won´t receive a signal in deep ravines or remote jungles – but just about anywhere else is going to work just great. We have a full report on this for Ecuador Living subscribers. Learn how to subscribe here. Until next message may you alswaysbe free! Our International Business and Investing Made EZ courses focus on helping delegates attain freedom lifestyles in two ways…though having their own global business and…seven types of global investing. 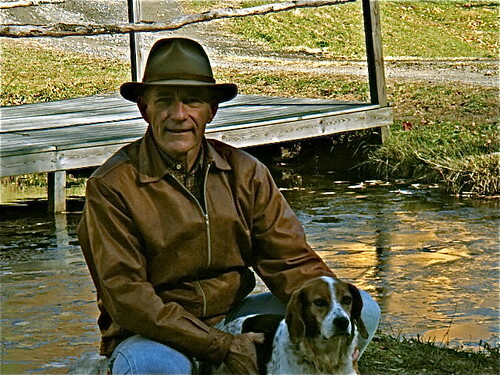 international business and investing so when the first ice appeared on our North Carolina pond last week we headed south and are in Ecuador now. 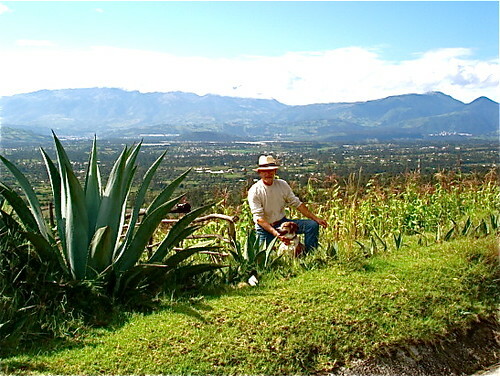 Ma and I are here…in the sun…overlooking Cotacachi!